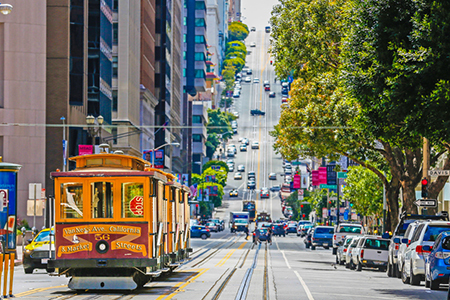 At the end of 2015, it became obvious that the undisputed superstar among all real estate markets in North America was San Francisco. Not too much room for surprise in this case for those who know that the average home price here went over the $1 million threshold in the first half of 2015 and hasn’t gotten below since. But what may catch some off guard when looking at this top 15 list of the most expensive housing markets in North America is seeing Vancouver—the third most expensive city in the world—down in the 6th position, behind a less expected entry: Brooklyn, N.Y.! The reason for this is the same one which pushed Toronto out of the top 10 list and to No. 11: a weaker Canadian dollar. With sky-high home prices becoming the norm in San Francisco, many are wondering how long people are going to be able to afford buying a home here, especially since the condo market is not significantly cheaper than the detached-home segment. According to real estate data company PropertyShark, at the end of 2015, the median home sale price in Manhattan went over $1 million for the first time. And if you take into account that in 3 Manhattan neighborhoods prices jumped over $3 million as well, then this news is expected. The state of California has another strong representative in list of the top most expensive housing markets in North America. And not just on this continent. With $700,000 the median home sale price, San Jose also ranks very high on the list of most unaffordable cities in the world, according to Demographia’s housing index. Said to be following in Manhattan’s footsteps, Brooklyn has seen home prices break all previous records in 2015. It’s a surprising entry into our list and its high median price reflects a peaking luxury market that has attracted a growing number of foreign investors. In the second and third quarters of 2015, Los Angeles saw home prices soar to levels last seen before the onset of the financial crisis. The fourth quarter, however, remained flat, leaving real estate experts looking ahead to the warm months for sales to pick up again. On the other hand, rentals in Los Angeles haven’t slowed down. They continue to climb all over town. The main culprit of Vancouver’s low position in our list is the Canadian dollar. The fact that it lost strength against the U.S. dollar made the Canadian real estate properties a much more affordable asset for American home buyers. 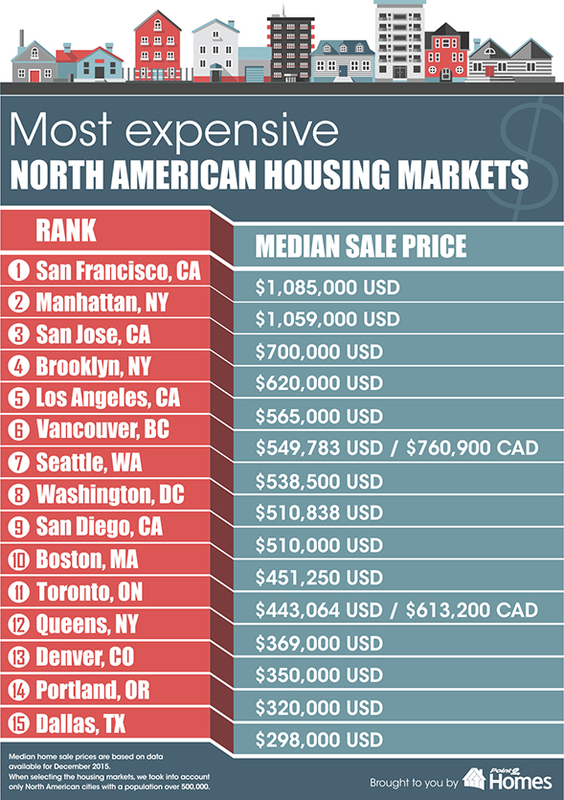 Now an average home in Vancouver (including condos) will cost Americans just a little over $500,000 USD, which is half of what they pay now for a home in San Francisco. However, the benchmark for a single-family home was, at the end of 2015, at record-levels — $1,226,300 CAD, which still means a jaw-breaking $911,240 USD. The tech boom Seattle has been seeing in the last years has taken its toll on home prices, which have been following a rising trend. Although the year-over-year growth is somewhere around 13 percent, real estate professionals expect the city to be the next Silicon Valley or New York in the next 5 years. Home prices grew exponentially in Washington D.C. especially between 2012 and 2014, when other cities were registering decreases. Although the pressure has eased a bit in certain markets, central neighborhoods continue to see prices sky-rocket. Almost reaching a tie with Washington D.C., San Diego is still more affordable than other counties in California, most notably Orange County and LA County. Home prices have been rising in the past years, leaving some experts wondering if the city hasn’t reached a bubble. Boston had several things to show off for 2015: 4 of its neighborhoods were included on the list of the hottest neighborhoods in the nation, plus the number of sales and the median home price continued to register increases compared to 2014. Despite its low position in our list this year, the Toronto housing market is still the second hottest in Canada, after Vancouver, and one of the most active markets in the world. The recent boom in condo development placed Toronto ahead of any other city in the world in terms of numbers of new recorded building permits. For more information, visit www.point2homes.com.